I'm trying to create a container view, with a controller that has a dynamic height, inside a UIScrollView and have it sized automatically using auto layout. View Controller A is the scrollview, which has the container view included, along with more content below. View Controller B is the view controller that I want to have a dynamic size and for all the content to be displayed in full height in View Controller A's Scroll View. It would be the expected output if View Controller B would also have 250 height. It also works fine for height 1000, so as far as I know, all the auto layout constraints are properly setup. Unfortunately, since the height should actually be dynamic, I would like to avoid setting a height constraint at all. I'm not sure if there are any settings for view controller B I can set for it to automatically update its size depending on its contents, or if there are any other tricks I've missed. Any help would be much appreciated! Is there any way to size the Container View in A according to how big the size of View Controller B is without setting a height constraint? Yup, there is. I managed to achieve that kind of behavior in one of my own projects. // in case there are other segues triggered from this view controller. At design time your root view has a fixed size (height). Now if all your subviews have a fixed height and are connected with fixed constraints that all have the same priority it's impossible to fulfil all these requirements unless the height of your fixed root view coincidentally matches exactly the total height of your subviews and the vertical constraints. 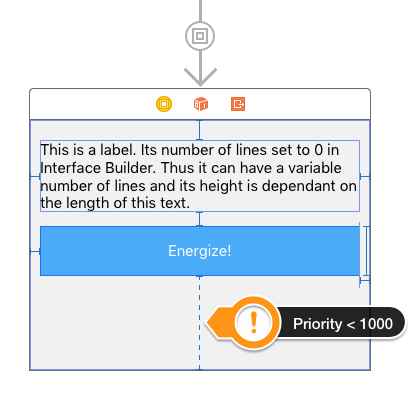 If you lower the priority of one of the constraints to 999 Interface Builder knows which constraint to break. At runtime however — when the translatesAutoresizingMaskIntoConstraints property is set as stated above — there is no fixed frame for your root view anymore and the system will use your 999 priority constraint instead. And taking care that the vertical constraints in IB are all set. Doing this you do not need to set view.translatesAutoresizingMaskIntoConstraints = false from outside the view controller. And then observe the contentSize height of the tableview and adjust the constant of the tableViewHeight constraint programmatically when needed. The accepted answer alone didn't solve the problem for me. My hierarchy: ScrollView --> Content View (UIView) --> Views | Container View | Other Views. 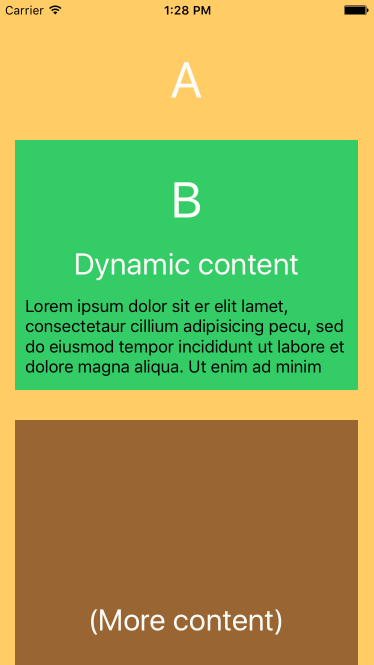 Content View: Top, Bottom, Leading, Trailing, Equal Width to ScrollView, but also with Equal Heights (constraint with a lower priority: 250). 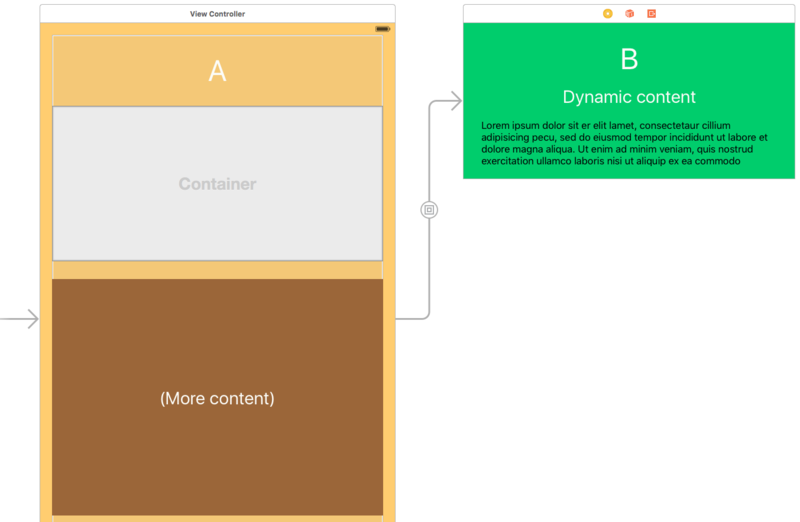 Container View: Top, Bottom to neighbor views, Leading and Trailing to Safe Area. Container View's embedded VC: Everything constraint connected vertically with the bottom constraint set to a lower priority, but bigger than the Content View's Equal Height one! In this case, a priority of 500 did the trick. Set view.translatesAutoresizingMaskIntoConstraints = false in either prepareForSegue() or in loadView() as other answers stated. Now I have a dynamically adjustable Container View inside an auto-resizing Scroll View. Building on @Mischa's great solution to this problem, if the container embeds a dynamically sized UITableView, then you need to look at overriding it's contentSize and intrinsicContentSize, as well as setting translatesAutoresizingMaskIntoConstraints = false as per the accepted answer. will not be called. This makes the UITableView appear as though it has no content. Overriding the intrinsic content size to return the actual content size means that the tableview is displayed with the size it's contents require. A great article by Emilio Peláez goes into more depth on this topic. Not the answer you're looking for? Browse other questions tagged ios uiscrollview autolayout uicontainerview or ask your own question. How to use auto-layout to move other views when a view is hidden? How can I use Autolayout to set constraints on my UIScrollview? What is NSLayoutConstraint “UIView-Encapsulated-Layout-Height” and how should I go about forcing it to recalculate cleanly?